Whether a majestic lion or a playful kitten, cats of all shapes and sizes are without a doubt the “royalty” of the animal kingdom — something the ancient Egyptians knew quite well. And boy, do our whiskered companions like to remind their humans of their prestigious bloodline! We all know that a #spoiledcat is a #happycat, but while a sunny napping spot and lots of love is all most felines need to be content, sometimes a little extra spoiling and long-overdue pampering is necessary to remind our royal companions just how much we care, and how much we appreciate their adorable antics (no matter the ghastly hour of night). A happy cat is just a few steps away. That rescued kitty you love with all of your heart — the one with the giant, clear eyes and kissable nose? She’s totes adorbs. But she is also a ferocious killing machine that wants to prove her hunting prowess to you. Our furbabies need exercise and cognitive stimulation just as much as their human counterparts do in order to maintain a healthy weight, and to stave off boredom-induced behavioral issues. However, cats in particular have natural hunting instincts that they long to satisfy, even if it means the occasional pounce on sleeping toes. Interactive playtime with your beloved feline is vital to constructive energy use, which tires Fluffy out and allows him or her to sleep soundly through the night. On the other hand, dedicated playtime with your cat also increases your companion/owner bond, and is in fact one of the best ways to show your feline friend that you care. Celebrity “Cat Daddy” Jackson Galaxy (@JacksonGalaxy | #TeamCatMojo) recommends 1-2 dedicated play sessions per day, which he calls “play therapy,” as well as a selection of (safe) baubles and toys for your kitty to interact with on their own while you are away. Your whiskered friend will soak up the extra attention, ward off unwanted stressors, and feel like royalty! Cats are creatures of cleanliness, a habit which starts from birth when the proud mama grooms her precious newborns, one by one. And you know what? Cats still love it, even as adults. Just like most people enjoy getting their hair washed at the salon. While cats may be incredibly efficient at self-grooming, taking some initiative in their beauty routine can become added quality time with your feline friend, and turn into an enjoyable pampering session. In fact, studies have shown that cats who enjoy being brushed and petted are more likely to be sociable and enjoy interaction with others, including an enhanced relationship with their owners! It’s a given that brushing your cat is necessary in order to keep their fur looking fabulous, as brushing stimulates blood circulation and sebaceous gland secretions, resulting in a healthier skin and coat. This is especially important as cats get older and less flexible, as they are more prone to matting. However, this routine is also a prime opportunity to spoil your cat with some much needed attention and take them back to their kittenhood. Do note that if your kitty isn’t fond of grooming, or is perhaps too active to tolerate it, a simple treat or reward can often reassure them. It’s also a good idea to incorporate some petting as you go along the way; the scent of you — their owner — is a lot less foreign than a kitty brush, even if that kitty brush does feel oh so good! But to really spoil your feline friend and shower them with the one-on-one attention they crave, simply taking a warm, damp washcloth and gently tracing around their face is a comforting reminder of mother’s love and safety. Followed by a soft bristled brush (and a kitty-sized head massager for extra pampering), your cat will melt into a puddle of purring contentment from the extra love. Like their regal and powerful ancestors, cats like to be the kings (and queens) of their jungle. They also enjoy teaching their humans to be creatures of habit, just as they are. Sometimes, the best thing you can do for your cat is to let them “train” you, especially when it comes to morning/nightly routines. While this can mean something different to every kitty depending on their unique personality, cats enjoy having a set routine with their humans. 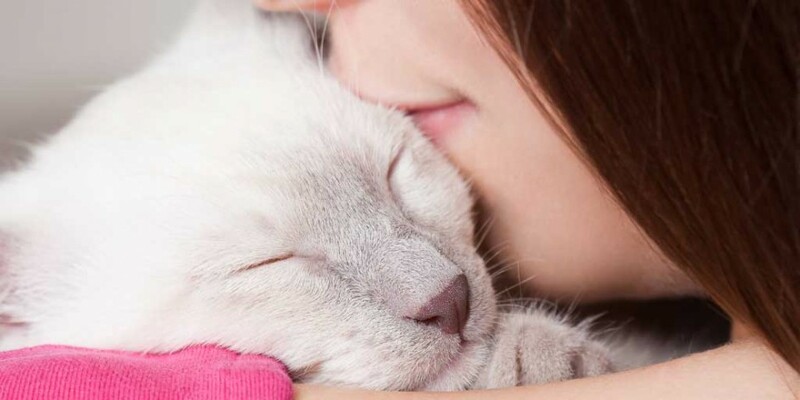 This can be as simple as feeding your feline a treat in the same spot every morning as you put on your shoes, or perhaps leaving a faucet running for them to drink from while you blowdry your hair — anything that allows your kitty the opportunity to be close to you, thrive on the consistency, and feel like they are in charge. It’s no secret that animals can interpret the nuances of their owner’s voice, but did you know they enjoy getting to know you too? Animals are social beings, and cats are known to be more vocal than their canine counterparts when it comes to their day-to-day interactions with their humans, although on the surface, they get a bad rap for being aloof. But in fact, studies have shown that felines typically tailor their vocal responses to better “converse” with their owners — and did you know that this unique, personalized language can actually help strengthen the bond between you and your kitty? Talking to your cat just as you would a human companion, utilizing their name often, and mimicking their sounds actually helps them to become more in tune with your emotions and vice versa. It’s your own secret language, which means regular conversations are just one more way to show your kitty some serious love. A quick Google, Pinterest, or Twitter search (#lolcats) is a good reminder that every cat has a distinct personality. The adorable quirks that make your feline friend YouTube worthy are also the very things that make them special and perfect for you, so embrace them! Felines are attention-seekers at heart, and treasuring the very things that make your kitty precious is a surefire way to make them feel like the cat’s meow. At KirinGie.Me, we believe every animal has a story, and we want you to share it! All of your kitten’s crazy antics caught on video, every status update, every photo — all kept in one location for you to treasure and share with a unique community of animal-lovers just like you. So go ahead. Be silly! Play soccer together with a ball of yarn, chase each other around the house, and try new things and activities to see what hidden talent your bundle of whiskers might possess, and be sure to document every moment. They love the attention, and you’ll love seeing how simply spicing up your relationship can make for a happier, healthier cat. And now for a bonus tip! The best way to make a cat happy? Giving them a safe home to feel loved and cherished in, and room to roam, pounce, and play. By adopting a new shelter kitty, you’re not only saving a life, you’re gaining a new family member! While we want to shower our whiskered companions with love during National Cat Day and beyond, we can’t forget that there are millions of unadopted shelter cats who could use some spoiling as well. Whether you would like to further the bond with your feline by giving them a new companion, or whether you’re a first time adopter, now is the perfect time to swoop in and be a special kitty’s hero! Founder of KirinGie.Me. A dreamer and believer that humanity can come together for the greater good and well-being of the pets we love. You and I can make a difference to reduce pet abandonment, relinquishment and euthanasia through community support, corporate sponsorship, and city partnerships. Ask me how and get involved.